We hope that you and your loved ones had a wonderful Christmas. Christmas Day marked the first time that our retail location has been closed in over a month and gosh golly, it was NICE! From this point forward, our retail location will be closed on Sunday. We will likely close for a second day during the week as well. For now, we want to keep the store open Monday – Saturday so that we can get a feel of when people are most likely to come in. We are now open at 10:30am instead of 11:00am as it seems that a lot of people are downtown in the mornings. We may even choose to open earlier but we don’t have any employees and we don’t want to spend the entire day at the store. Yes, even Aidan can get bored at a toy store! Your feedback is always welcome and appreciated! 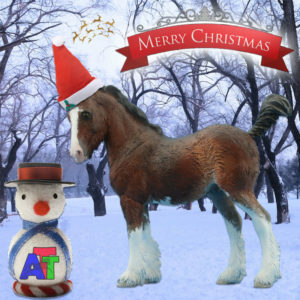 For those wondering, the horse pictured above is Phineas, a Breyer Custom Clydesdale Foal by Karen Griegsen. Aidan’s Toy Trove Retail Store will reopen on Tuesday, December 26th and resume the normal hours of 10:30am – 5:30pm. It’s a bit up in the air if we will be open on New Years Day. I need to poke around downtown and see what stores are open and what stores are closed. We had a blessedly busy time at the retail (and online!) store in the weeks leading up to Christmas. We expect the pace to slow down in January and we will hopefully have time to rearrange the shelves into something that at least resembles order. 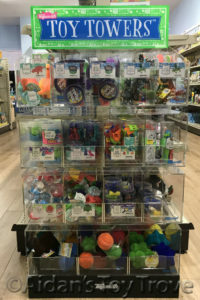 I find myself constantly putting toys back on the shelf where they ‘belong’, kids have an uncanny knack for finding toys in every nook and cranny of the store! And please don’t apologize if you tobble the Tobbles! They are after all TOBBLES. 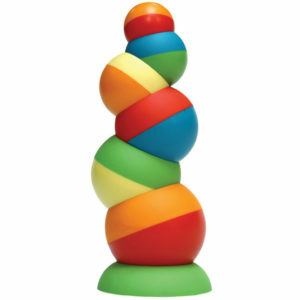 Who can resist pushing the gravity defying tower just a little more?! As a side note, we only have 2 Tobbles left in stock. We are running low on a lot of merchandise. Our Pocket Magic and Magic Kits were extremely popular as were our magnetic games and Brainteaser puzzles. We are having a hard time stocking our super fun Brainteaser puzzles so what you see in the store now is all the we will have for a while. 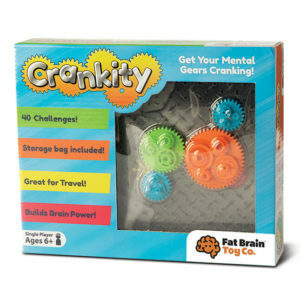 Our Fat Brain games Coggity and Crankity flew off the shelf but we still have a few left. We have both of these challenging games set up in the front of the store. If you haven’t seen these games, please come and check them out. I promise that they will get your mental gears cranking! We also made some progress assembling and filling our exciting and ever growing Toy Tower! 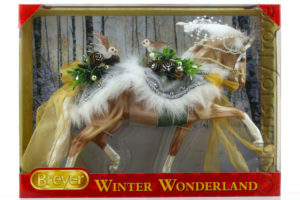 Last Friday, we received a big shipment which included the Breyer 2018 Holiday Horse Winter Wonderland and an assortment of Breyer barns, dolls and accessories. 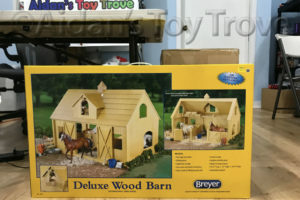 I knew that the Breyer Traditional Deluxe Wood Barn would be big but I didn’t know that it would be THIS BIG!! At last Breyer, you have provided me with something that I can’t ship! We originally sold out of all of our Winter Wonderlands but now we have a few more to sell  If you haven’t seen him, he is the Totilas mold in a lovely pearly perlino with Holiday attire and 2 adorable new owl sculpts hidden in his tack. The Standing Owl is part of the Collecta 2018 Lineup. I didn’t see the other owl in the catalog but I could easily have overlooked it. 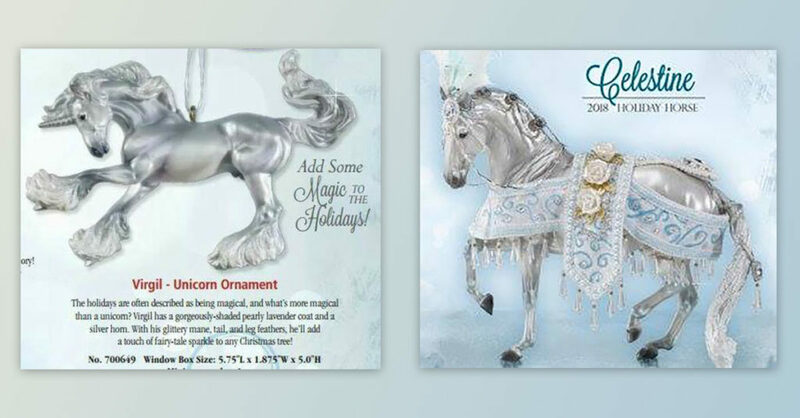 Speaking of Holiday Horses, Breyer revealed the 2018 Holiday Horse as Celestine. She is the new Premier Club Lipizzaner mold in a pearly white with wintry tack. Some collectors think that she looks partially translucent. I personally don’t think that she is but only time will tell! 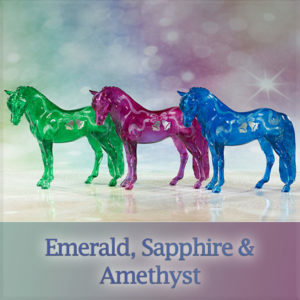 As this blog post is already getting rather lengthy (and I am rather tired), I’ll make a separate post about the Breyer Christmas Special Runs Emerald, Sapphire and Amethyst. Thank you everyone for your support. The holidays aren’t quite over yet and we sincerely hope that you have a fantastic end to the year. You might even see a special New Years Sales from us! Happy Holidays everyone and thank you, thank you, thank you!